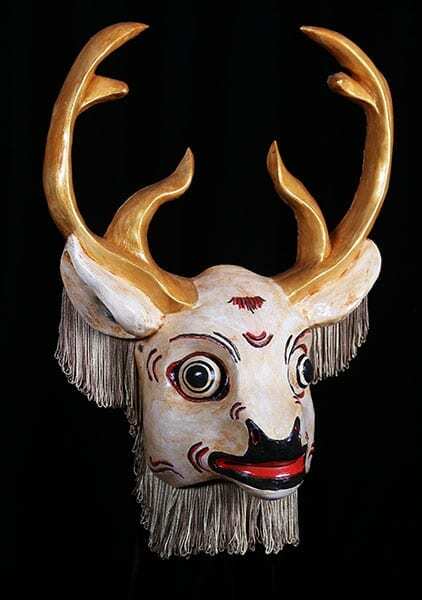 This custom theater mask has been made in traditional Balinese Topeng style, representing the Deer. Traditionally used in various forms of dance, this mask is designed to withstand movement. This animal mask provides a magical presence in the stories it is a part of. It has gentle, mystical air about it. This deer mask s a lovely addition to the animal masks in the collection. Know when you buy that this custom mask by master mask maker Jonathan Becker is not kept in stock so allow a few days for its creation. Dance the Deer mask Dance and chase the demons away. This custom theater mask has been made in traditional Balinese Topeng style, representing the Deer. Traditionally used in various forms of dance, this mask is designed to withstand movement.